Cairo Zaks doesn’t need much of an introduction. 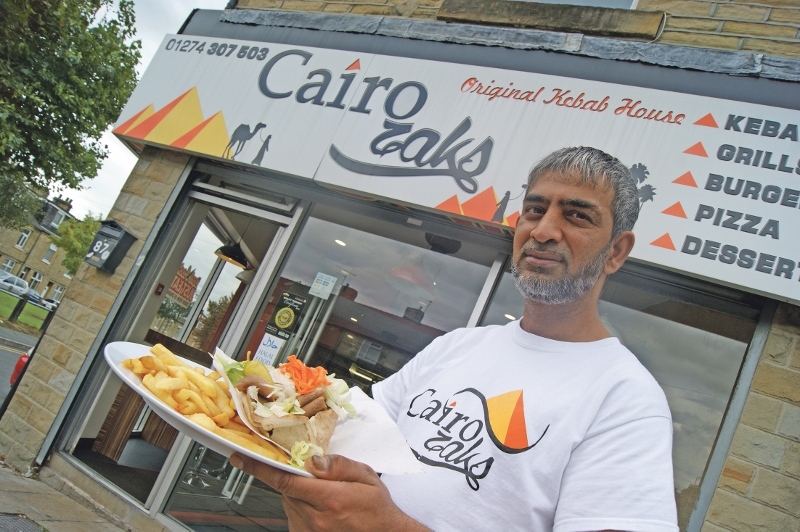 It’s been serving top notch kebabs for over 38 years to happy customers on White Abbey Road in Bradford. Inside, the takeaway and diner has a modest yet comfortable decor which plays on the Egyptian theme. Paintings of camels hang on the sandy coloured walls and Moroccan style lamps provide an ambient glow. Like many restaurants with a loyal fanbase, there’s no need for menus on the wall. The staff will, of course, hand you one should you want to eat something other than the banging kebabs. Zak, the owner, says: “My brother and I have been here since 1978. Everyone knows us. Asian Express tucks into a fluffy pitta that’s filled to the brim with fresh salad, zingy yogurt dressing and a generous portion of lipsmacking kebab meat. Topping it off to perfection is the homemade chilli sauce which adds a kick of heat and a flash of zing. It’s a condiment that’s tempting enough to make even Tutankhamen himself spring back to life from his sarcophagus. “Some people now even want to buy it by the bottle,” Zak adds. Cairo Zak’s is right in the heart of the Asian community and was the first in the area to do halal pizzas and burgers. “I came back again last year after leasing the place out, and I’m getting it built back up again,” Zak smiles.